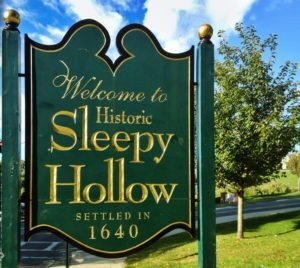 Sleepy Hollow is a village in the town of Mount Pleasant in Westchester County, New York. The village is located on the east bank of the Hudson River, about 30 miles north of midtown Manhattan, and is served by the Philipse Manor stop on the Metro-North Hudson Line. To the south of Sleepy Hollow is the village of Tarrytown, and to the north and east are unincorporated parts of Mount Pleasant. The population of the village at the 2010 census was 9,870. 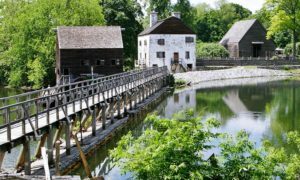 Immortalized in Washington Irving’s famous tale, The Legend of Sleepy Hollow, this quiet Village has preserved much of its history and natural beauty. Initially an agricultural district, Sleepy Hollow later became a manufacturing center, producing items such as steam-powered automobiles, shoes, and batteries. Around the turn-of-the-century, Sleepy Hollow’s bucolic setting and close proximity to Manhattan attracted millionaires like Anson Phelps, Ambrose Kingsland and John D. Rockefeller, who built beautiful mansions in the area, some of which are open to the public. This peaceful village along the Hudson is rightly proud of its rich history. From Washington Irving’s tale that gives the town its name, to the Rockefellers and a host of buildings from the 17th and 18th Centuries, Sleepy Hollow’s past is full of intrigue and notable events. Yet today, it remains a quaint, verdant, welcoming community of about 9,000 residents. Today Sleepy Hollow combines city convenience and small-town charm. Residents enjoy a plethora of outdoor adventures with parks, forests, rivers, lakes, streams and trails along one of the most scenic stretches of the Hudson River. For more information on Sleepy Hollow please Click Here.